Search Engine Optimization: In Search Engine Optimization we improve results from the traditional search engine listings often referred to as the "editorial', "organic", or "natural" results. 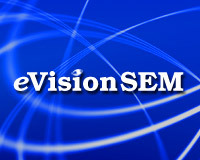 eVisionSEM can help you with search engine marketing right over the phone. Using screen share technology, SEO industry expert George Aspland can answer your questions and help you determine steps you can take to improve your organic search results. Mini Site Review. Together we can look at your web site to see if there are some key issues you can work on to improve your organic search results. Competitive Analysis. We can compare you site to one or two key competitors for some of the very important factors that affect organic search positions such as Link Popularity (Linkto gloasary) and Social Engagement. Keyword Research. We can perform some keyword research together using one or more of our keyword research tools. Analyze Your Site Analytics. Together we can review your Google Analytics, possibly show you how to use this very helpful tool, as well as look for issues and make suggestions. Answer your questions, with examples if possible.